Around 1994, I contacted a cousin who sent me an enveloped with a bunch of old photographs in it. Almost known of the photographs had names on them. I went over the photographs with my Mom, my Grandmother, and my Mom’s cousin, Ted. They identified as many as they could, but many went nameless. This wedding photo was one that we could not put names to. Ted was able to tell us the names of the couple in the background. They were his parents, Maria (Pacheco Smith) and Anton Souza. The only other information he could give me was that the couple looked like Pacheco’s. Given the fact that my Grandfather had 45 Pacheco cousins who made it to adulthood, that really did narrow it down. We figured that the couple was married around 1915-1920, which also didn’t help much. I passed the photograph around from cousin to cousin. Eventually, someone was able to put the names to faces for the bride and groom. They are Antonio Pacheco (aka Tony Algrava) and Georgina Medeiros. Antonio was the son of Manoel Pacheco and Jacintha Rosa Moniz. Georgina was the daughter of Antonio Medeiros and Maria Julia d’Aguiar. Both Antonio and Georgina had grown up on Kauai, Hawaii, though in different towns. It’s unclear to me when they met up. Georgina’s parents never left Hawaii. Georgina was living in Koloa, Kauai, HI in 1910. Antonio left Hawaii with his parents in 1907 and settled in Oakland. My guess is Georgina probably came to Oakland with relatives. Or, maybe it was an arranged marriage, which was not entirely unheard of between the Portuguese at the turn of the century. They were married around 1913, most likely in Oakland. Their first child, Edward, was born in 1914. This photograph is somewhat special as it’s the only one showing Maria and Anton, my Great Aunt and Great Uncle, prior to their marriage on the 4th of July 1914. 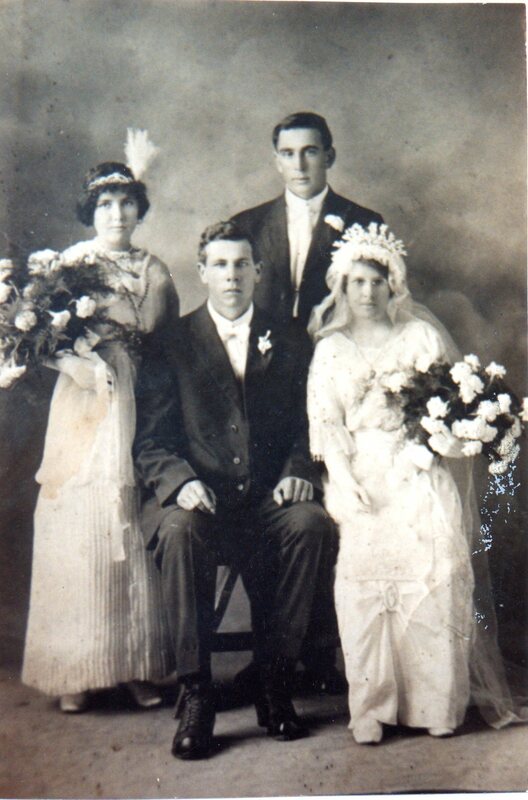 I have another photograph prior to this wedding showing Antonio, Georgina, Anton, and another woman besides my Great Aunt taken in 1913. I originally thought that Maria and Anton were in this wedding photograph because Maria and Antonio were first cousins. But, the earlier photograph taken in 1913, shows that Antonio and Anton were friends prior to Anton and Maria’s marriage. The little details you can learn from photographs! This photograph is a clear example of why it is so important to pass unknown photographs around to as many people as possible. You never know when someone is going to recognize a face as their Grandma or Great Aunt. It’s only then do we get to put the faces and the names together.